Joe Galloway with the U.S. Army's 24th Infantry Division Mech outside Basra, Iraq, on the day of the ceasefire in the Persian Gulf War, 1991. Joe Galloway with the U.S. Army's 256th Stryker Brigade outside Mosul, Iraq, in January 2006. › What: Welcome Home Celebration Honoring Vietnam Veterans. › Tuesday, March 28, Tivoli Theatre, 709 Broad St. — Screenings of “We Were Soldiers” at 10 a.m., 1:30 and 4 p.m. Each showing will be followed by a panel discussion moderated by Joe Galloway, co-author of the book “We Were Soldiers Once … and Young,” and featuring soldiers from the movie. › Wednesday, March 29, Chattanooga National Cemetery, 1200 Bailey Ave. — A final welcome home featuring an address by Joe Galloway, 6-7 p.m.
Joe Galloway did not volunteer to be a spokesman for all of the Vietnam veterans who have felt shunned, disrespected and neglected over the last 50 years, but he is proud and honored to have done it. 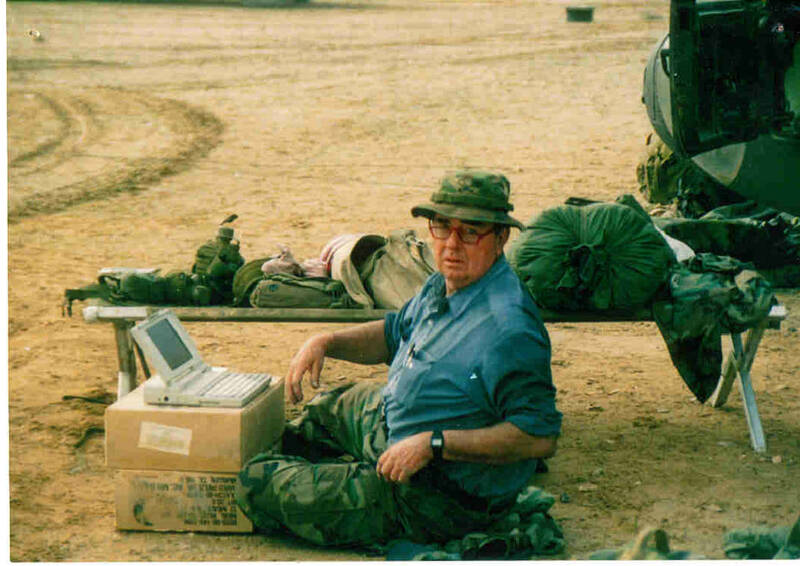 Galloway was a war correspondent for most of his career, but in the '60s and '70s, he was a reporter for United Press International. He covered battles during four tours in Vietnam and had a front-row seat for some of the action. In 1992, he and Lt. Gen. Harold G. Moore co-wrote the book "We Were Soldiers Once and Young," which was made into a movie starring Mel Gibson in 2002. The book focuses on the 1st and 2nd Battalions of the 7th Cavalry Regiment in the Battle of the la Drang Valley in November of 1965. It was the first large-scale battle of the war involving U.S. troops. The book and movie helped give voice to the brave soldiers who fought and died there, and it made Galloway a spokesman for them over the years. "I never volunteered to the extent that I do function as a spokesman, but it's a great honor and mostly a pleasure to sort of be that," he says. Galloway is a member of several boards related to the military and veterans, including the Vietnam Veterans Memorial Fund, the 1st Cavalry Division Association and the National Infantry Museum. For the last four years, he has been a consultant for the Vietnam War 50th Commemoration project, traveling the country. He speaks at reunions, jubilees and gatherings of veterans, and he has been filming interviews with Vietnam veterans collecting their stories. "I just love it. I've got 375 in the can, mostly one and a half to two hours long, and every one I learn something I didn't know about the Vietnam War," he says. Those films will be sent to the Library of Congress. The work is part of an official initiative created and funded by Congress to honor and welcome home Vietnam veterans. "It's taken 50 years to get here," Galloway says. "Attitudes have finally changed, and it's about time." Communities across the country started hosting events to honor the vets two years ago. Chattanooga will host a three-day jubilee this week, with Galloway as a guest speaker and honored guest. "This is a chance to finally welcome these men home," says Bud Alley, a Vietnam vet who recounted what happened to the 2nd Battalion 7th Cavalry immediately following the initial battle in the la Drang Valley in his book "Ghosts of the Green Grass." Alley is the event coordinator for the Chattanooga jubilee. "We are very honored to have Joe Galloway here for this, but this is about honoring these men," he says. Galloway will be conducting interviews for the ongoing film project while he is here. The stories, he says, "raise the hair on the back of your neck." There are common themes, of course, but the variances can be striking. He says the stories are so different because "we didn't fight one 10-year-long battle; we fought 10 one-year-long battles." U.S. troops were sent into battle for 12-month stretches. The fighting was sometimes done against trained soldiers and sometimes against locals who fought in unconventional ways. "You could have different types of battles just a few miles apart," Galloway says. Galloway experienced the war from many viewpoints because of his ability to move from outfit to outfit. As a frontline correspondent, he was on the ground with the soldiers, and that made him one of them. He says he first became known as "that crazy reporter," and soon he was introduced as "our crazy reporter." "I saw what they saw. I was not a soldier. I was a reporter and a photographer, sort of. I was always welcome for no other reason than I was a sign that someone cared about them. Someone wanted to tell their story." Unlike with previous wars, U.S. soldiers who fought in Vietnam did not come home as heroes. In fact, many were shunned, spat on, called names such as "baby killer" or "murderer." As a result, many packed away their uniforms, medals and memories and tried to forget it ever happened. "You can't push that down," Galloway says. "What you saw, what you heard, the smells. I used to think if Col. Moore and I got that book published, it would close that loop, and it did nothing of the sort. You can't put those memories in a box in a closet." He says veterans soon learned that the best way to make sense of things and to keep their sanity was to attend reunions where they could talk with someone who understood. "We all thought we went crazy in November because of seasonal changes or something, but it was not that at all. All of these memories came flooding back, and the one place you could be sure you could share those memories was at a reunion. One guy missed it one year and said, 'I'll never do that again. I use those to recharge and get me through the year.'" These welcome-home jubilees are the next step because they are taking place in the cities and communities where the men live and work. "This is not a big parade in New York or Washington, D.C.," Galloway says. "These men came from rural communities and small towns, and they came home to no respect, and they were not noted or welcomed home. They went to ground. This helps to fix that."